A round-up of all improvements and changes to the Buzz platform in version 2.0.89, available on February 9, 2017. 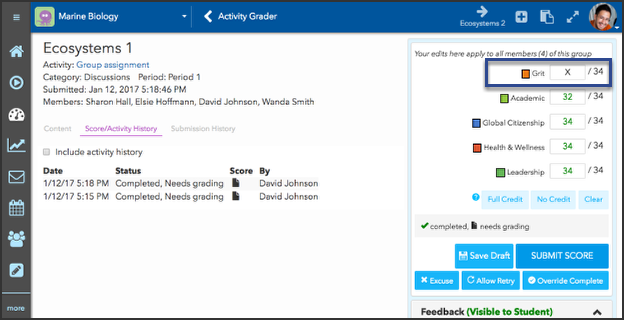 This week, we have introduced some improvements to the teacher experience in Buzz. 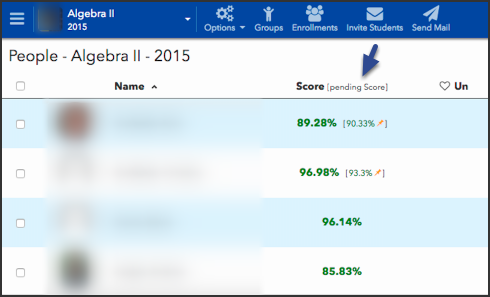 Pending Scores are visible only to teachers, and they appear only when one of two conditions above are met. They are displayed in brackets next to the Current Scores, as seen in these screenshots. 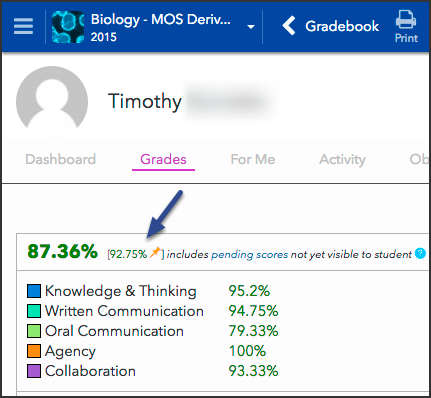 Cleaning up the student grade summary and adding completion progress bars. 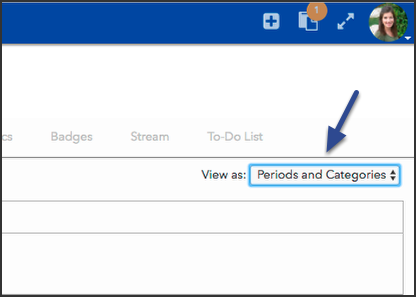 Providing a dropdown to toggle between the Periods and Categories and Syllabus views. 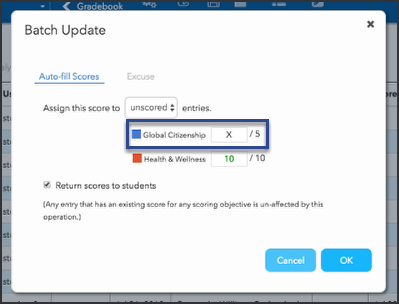 In a Multi-Outcome Scoring courses, we gave teachers the ability to selectively excuse students from individual scoring outcomes in an activity by entering an X in the score box for that outcome. Doing this excludes that outcome from impacting the activity's grade. Gave admins the option to edit an enrollment's External ID, which is any ID needed to align the enrollment with an external program or application. 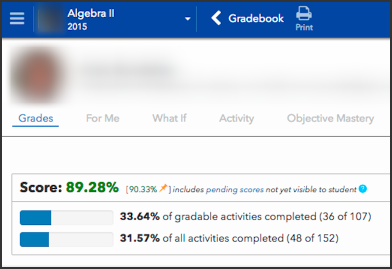 Fixed an issue where, in Grade mode, the Activity Grader incorrectly showed score boxes for already-excused activities. It now shows the X to indicate excused activities rather than the score box. Revised objective indicator colors so that they stand out distinctly from theme colors chosen by the user. Open the Activity Editor > Gradebook tab. Updated the Editor to clear the LTI setting when changing Custom Activity from a website option to a course resource or Google Document option. Fixed an issue where the text entered in question metadata to act as that question's Placeholder Text would not appear in the correct field in the question editor. [Edge] Fixed an issue that kept badge requirements from appearing when you select a badge in the Badges screen. 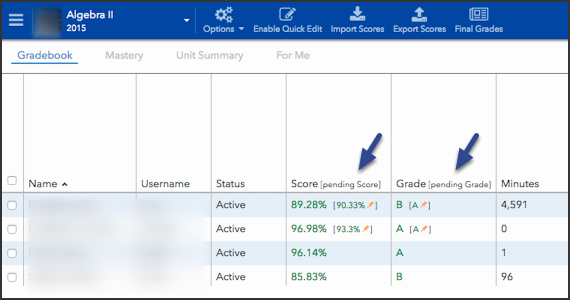 Fixed an issue that kept the Performance > Activity Grader toolbar from appearing after selecting a student and then clicking the < Activity Grader button. Fixed an issue caused the Activity Grader to continually display a Are you sure you want to leave? prompt after the user has already navigated away from the Grade mode. 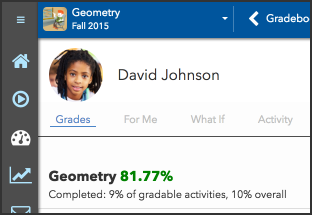 Updated the way the Performance tool displays grades for activities set to Treat unscored as zero, so that the zero remains after submission until the teacher submits a grade. Fixed an issue that required students to refresh the All Courses Performance screen in order to see the toolbar options. Updates in version 2017.2.8.2254. Learn more. Grade and Response schemas: The schemas have been updated with a new attribute, status, for the objectivescore node. Grades schema: The schema has been been updated with several new attributes: completable, completed, gradable, and completedgradable. GetEntityGradebookSummary: A new response attribute, scored, for the objectivescore node. GetActiveUserCount: Two new attributes, includedescendantdomains and persona, to increase the querying options and responses. ListEnrollments: A new attribute, includedescendantdomains, to query all subdomains of the specified domain. Hi, The previous Gradebook displayed the name of the course beside the percentage score, which was more efficient for processing the final grades of the students. The new look removed the course name from the display. This has already lead to a couple of errors for the teachers grading. Can we request it to be added for more efficiency?